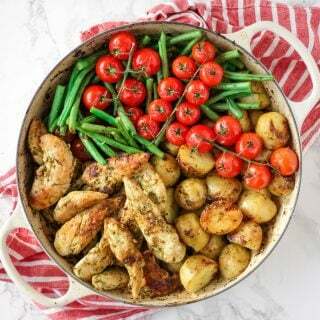 This pesto chicken bake is an easy, one pan, oven baked, family dinner. It's also dairy free and gluten free and packed with two portions of colourful vegetables. Put the potatoes and olive oil into the pan, toss the potatoes until coated and bake for about 30 minutes, until starting to soften. Add the chicken fillets and then spoon the pesto on top of the potatoes and chicken. Put back into the oven for 10 minutes. Add the green beans and tomatoes, with salt and pepper and toss in the pesto-y juices. Put back into the oven for 10 more minutes or until the chicken is cooked through.